It’s hard to miss the Burlington Brew Tours bus when it comes to pick you up. At happy hour last Friday, I was standing outside Seven Days’ headquarters when a shuttle emblazoned with a frosty beer mug arrived. At the wheel was Chad Brodsky, the 26-year-old owner of Burlington Brew Tours and our designated driver for the evening. His 5-year-old business capitalizes on Vermont’s growing craft-beer scene by offering guided tours, for about $70 per head, of old and new breweries in the Burlington area. Brodsky threw open the door, and I climbed aboard and filled out a name tag. Our companions were two twentysomething couples on vacation in Vermont — one from the Finger Lakes region of New York and the other from the Jersey shore — and a tour guide in training named Fred Trombly. Our mission: to hit up three local breweries in four hours, learn something about how beer is made and swill a lot of suds along the way. “We’re going to introduce ourselves with a little ice breaker,” Brodsky announced as the shuttle bus took a wide turn onto Main Street. He went first: Brodsky lives in Burlington but grew up in New York, he explained. He’s a home brewer who selects beer based on the season. His favorite brew is double IPA, such as the Alchemist’s celebrated Heady Topper. By the time we were all introduced, we had arrived at our first destination: Vermont Pub & Brewery, the oldest craft brewery in Vermont. VPB’s cofounder, the late Greg Noonan, was an early partner on Burlington Brew Tours and an inspiration for Brodsky. Inside, the bar was hopping with happy-hour drinkers, but we walked right past them and into the cramped basement to see where the beer is made. Brodsky explained the basics of brewing and asked if we knew the four ingredients of beer. It took a while, but eventually we correctly guessed hops, water and yeast. Then silence. “Air?” someone attempted. Brodsky shook his head. Finally, he revealed the fourth ingredient: malts. Brodsky pointed out the mash tun, where grains are steeped in 150-degree water and starches turn to sugars; and the kettle where the sweet wort from the mashing is boiled and flavored with bittering and finishing hops. The boiling brew is then cooled with cold water in a radiator-like contraption called a “heat exchanger,” Brodsky said, before yeast is added in the fermentation tank. Through a small metal door, Brodsky led the group one by one into a cooler room where the lagers age. Through another door, with just enough room to stick a head in, he showed off the nerve center of Vermont Pub & Brewery’s tap room: a contraption nicknamed “Medusa” that consists of a dozen plastic tubes siphoning beers from basement kegs to waiting customers overhead. 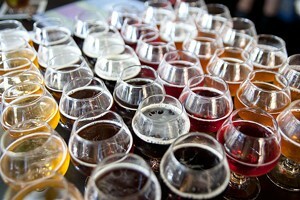 Back upstairs, beer samples in little brandy snifters were lined up on the bar like duck pins at a bowling alley. We quickly knocked them down while Brodsky explained what we were drinking. He passed around a cherry-red beer called Forbidden Fruit, a sour-mashed ale that’s a VPB staple. The second stop was Magic Hat and its Tim Burton-esque Artifactory. Inside the plant, the bottling line was in full production mode. From a perch above the factory floor, we watched the empty bottles — Brodsky called them “soldiers waiting to go into battle” — whiz down the production line and get slapped with a label, filled, capped and gently loaded into waiting cardboard 12-packs. We moved to the next room, where samples of malts and hops in glass jars are available. Brodsky offered Munich and Crystal malts to the couples, who tasted them hesitantly. “It tastes like Grape-Nuts,” remarked Dana Borysewicz, a Zumba instructor from New Jersey. To wash that down, Brodsky led us back to the main room and growler bar. On tap was an assortment of quirky brews, among them Pistil (an ale made with dandelion leaves) and an Imperial Pilsner that’s so new, its alcohol-by-volume is still unknown. Also on offer was a brewery-only beer called Blind 9 — a blend of Blind Faith and Magic Hat’s most successful beer, the apricot-flavored #9. Back on the bus, Brodsky announced that the third stop would involve food — and, of course, more beer. “We’re going to blow them away,” Dion vowed. Over a plate of mostly fried food — hot wings, jalapeño poppers, a slider and French fries — Brodsky recounted how his tour business started. Five years ago, as a senior at the University of Vermont, he saw a market for brewery tours that showcased Vermont’s famed craft beers and drove participants safely home afterward. Brodsky pitched the idea to VPB’s Noonan — who said he’d gladly host tour groups — purchased a 12-passenger van from a minister in New Hampshire and got to work. He donned lederhosen and stood on Church Street enticing potential customers. His first, he recalled, was a guy who took the tour alone after his wife and daughter opted for shopping. “It was essentially a man date,” Brodsky said jokingly. Eventually, he purchased the shuttle bus he currently drives — a 1997 Ford Super Duty — and added a Stowe-area tour. 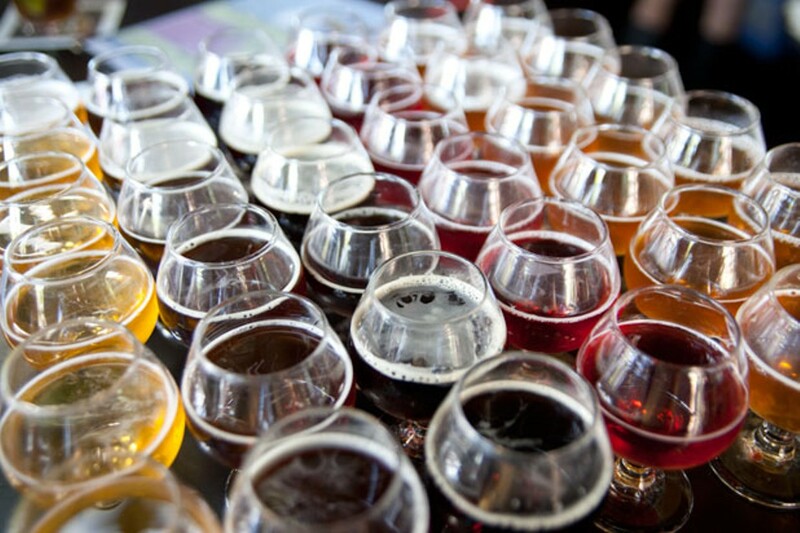 That one stops at the Alchemist in Waterbury, Trapp Family Lodge Brewery in Stowe and Rock Art Brewery in Morrisville and then returns to Mr. Pickwick’s Gastropub and Steakhouse in Stowe for a pairing of rare and imported beers with Vermont-made cheeses, meats and fresh veggies. The Stowe tour costs $130 and is a full-day affair, running once a month or by appointment and limited to parties of five or more. Brodsky said he gets frequent requests to tour Hill Farmstead Brewery in Greensboro — one of the most buzzed-about craft breweries in the country. But “that would be a seven-hour tour,” he noted, and he’d rather spend the hours in breweries than in the car. Brodsky has opened new tours outside Vermont’s borders. 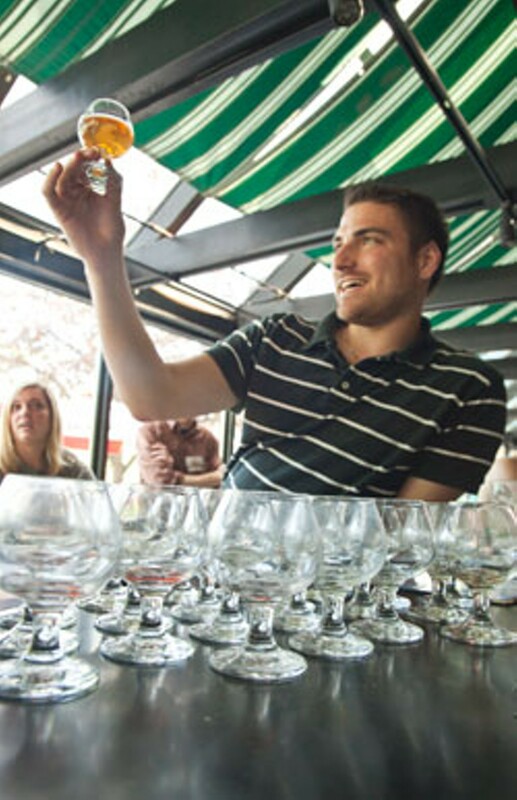 He founded Boston Brew Tours six months ago, which for $85 stops at Samuel Adams and Harpoon breweries, among others. On June 1, he’ll launch Portsmouth Brew Tours in New Hampshire. In February, Brodsky quit his full-time job as a financial analyst at Vermont Federal Credit Union to devote himself exclusively to beer tourism. He is also the founder and owner of ShoutPlans, a social-media app that helps friends meet up for, among other things, beers. And he’s in the second round of auditions to take his brew-tour biz on the reality-television show “Shark Tank,” where entrepreneurs pitch ideas to a panel of investors. Burlington Brew Tours’ motto is “You drink, we drive,” and it’s a good thing, because after three hours of beer swilling — and our first full pint, at ONE Pepper Grill — the rest of us weren’t feeling much pain. The last stop on Friday evening’s tour was also the point farthest south — Fiddlehead Brewing Company in Shelburne. Fiddlehead is the brainchild of former Magic Hat head brewer Matt Cohen — better known by his nickname, Matty O. The year-and-a-half-old brewery gleams with chrome fermenter tanks that tower over a spotless concrete floor. Brodsky again quizzed the now-slightly-woozy crowd. What are the four ingredients in beer? What’s mashing? What do you call the sugary water that results from mashing? Almost in unison, the couples nailed every answer. Four breweries and lots of beers later, Brodsky’s lessons had sunk in. Fiddlehead had three beers on tap that evening — Helles Lager, Double Wit and its flagship IPA. But we got to sample a beer that’s still in the fermenting tank: Dan K’s Double IPA, an intensely bitter ale made with 66 pounds of Columbus hops. “It’s super dank,” said a Fiddlehead employee as he opened a valve and collected the uncarbonated brew in a Ball jar.